These 3 Iced Coffee Recipes are sure to please during the summer months! 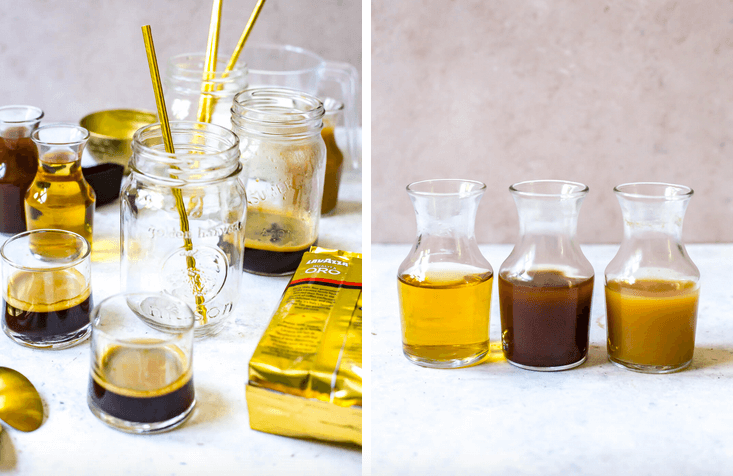 In this post I show you how to make iced coffee: everything from an iced vanilla latte, iced mocha and iced caramel machiatto, and the three homemade syrups you'll make will last in the fridge for more summer coffee drinks! This post is sponsored by Philips – thanks for supporting the brands that help keep my blog up and running! You guys know by now that I'm a HUGE coffee fan but did you know that every morning, rain or shine, sleet or snow, I drink iced coffee?! 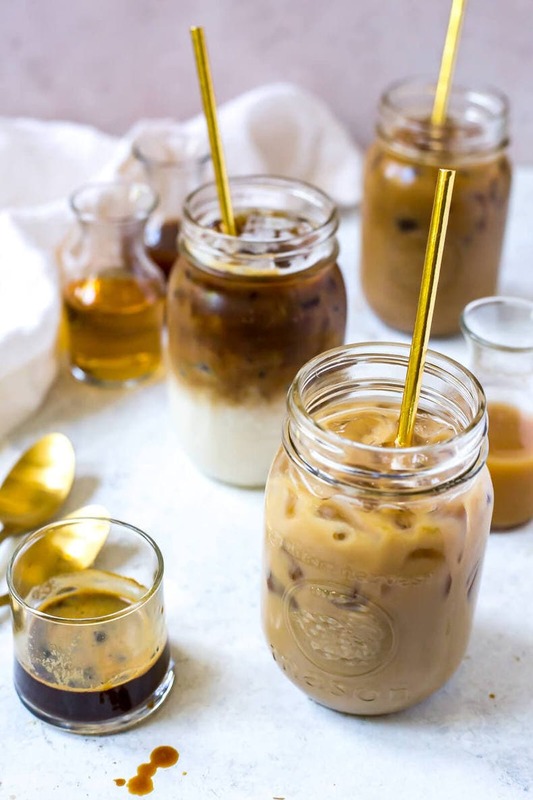 It's my absolute favourite way to wake up – there's something just so refreshing about a big tall glass of slightly sweetened iced coffee, but the same old thing can get boring so I'm here to bring you outside your routine to try a few new spins on everyone's fave summer drink. 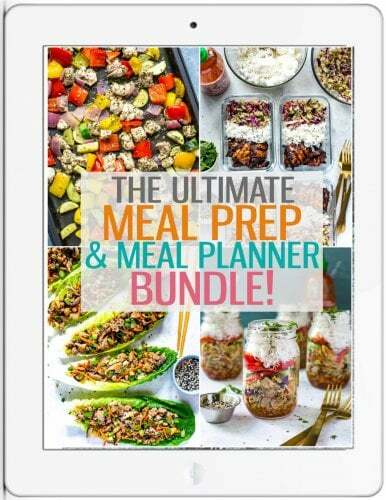 And just in time for cottage season and vacation mode at that! I mean, who doesn't love iced coffee in the summer time?! There's nothing better than driving up north to cottage country, kicking back with family and friends and indulging in a delicious iced coffee on the dock with a magazine or two. It honestly feels like forever since I've been up to the family cottage, and a luxurious coffee is always a must. But it has to be the right kind of coffee – vacation time and long weekends are few and far between so you have to make sure you've got the right machinery to do the job right! And I don't know about you, but hot or cold, I like my coffee STRONG. Well let me fill you in on one of my fave new coffee machines thanks to my new partnership with Philips! With the Philips 3100 coffee and espresso machine, you can enjoy your fave espresso hot or cold, whether you’re at home or on vacation – no trip to the coffee shop required to make a special drink for a special occasion, okay?! This machine is so versatile and really does a great job of making strong espresso-based drinks. You can make a cappuccino, machiatto or latte with the touch of one button, and you can use either whole coffee beans (there's a grinder in the machine) or pre-ground coffee and espresso to brew the perfect cup. You can make one touch cappuccinos that are an uncomplicated bean to cup experience. The grinders are 100% pure ceramic so they are extremely hard and precise, meaning you can enjoy fresh aromatic coffee for at least 20,000 cups. This machine in particular is really great for iced coffee because you can adjust the strength of your espresso shots, allowing you to choose whether you want a stronger drink or something lighter to sip in the sun. The machine has five different levels of strength – I have mine set on the highest level of course! – and the adjustable spout should fit any cup of coffee so you're good to go with a short hot drink or a tall cold one as well! Enjoy your fave drinks for your special moments; whether espresso is your thing, or you prefer more milk-based drinks or just plain old coffee, there's something for everyone and it's ready super fast, almost instantly. But let me be clear that the coffee sure doesn't taste instant! 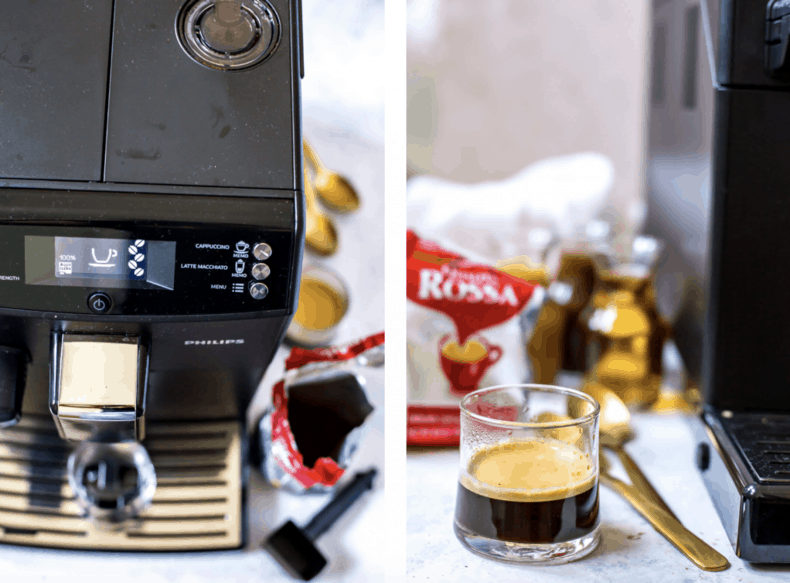 I've actually tried quite a few automatic coffee machines and Philips hands down is my favourite – as long as you're also buying high quality coffee, you won't be disappointed! Well first of all, you really need the proper machine to do the trick, and that's definitely the Philips 3100. But beyond that? The brew itself! Make sure you're buying either espresso beans or pre-ground espresso for these iced coffee recipes. I usually go for a medium roast and brew it on the highest intensity setting; in terms of brands I love LavAzza and Illy but you may just have to experiment and see what tastes the best to you. I've heard that buying the beans and grinding them fresh will get you the best brew but it all depends on what you can get your hands on. With the Philips 3100, I haven't noticed too much of a difference in taste between fresh ground and pre-ground but I like the fact that you have options to go either way. 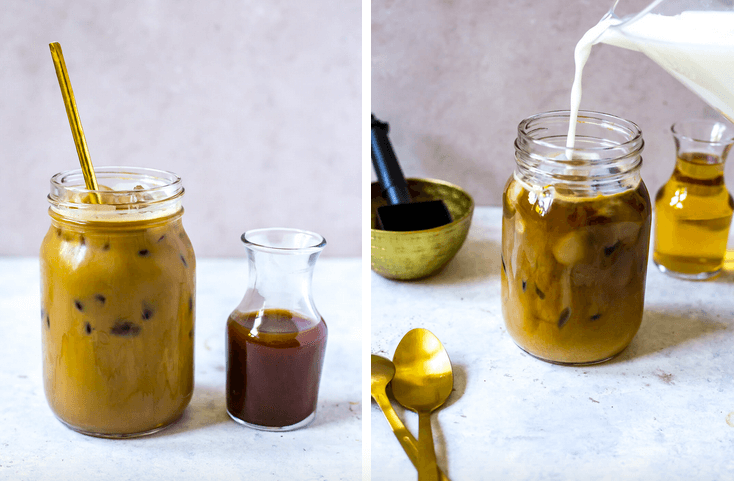 Now, onto all the different types of iced coffee you can create, and that comes down to the homemade vanilla, mocha and caramel syrups I have listed below! 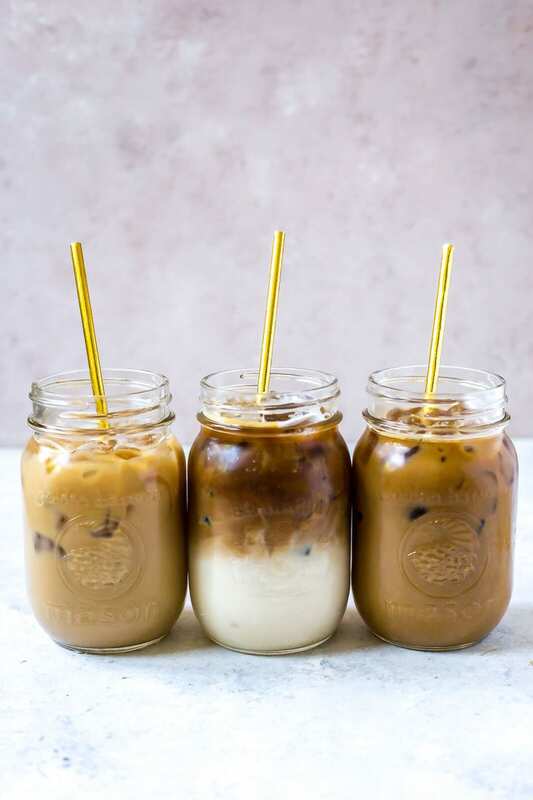 Keep reading to find out how to make these three iced coffee recipes, they are so easy! 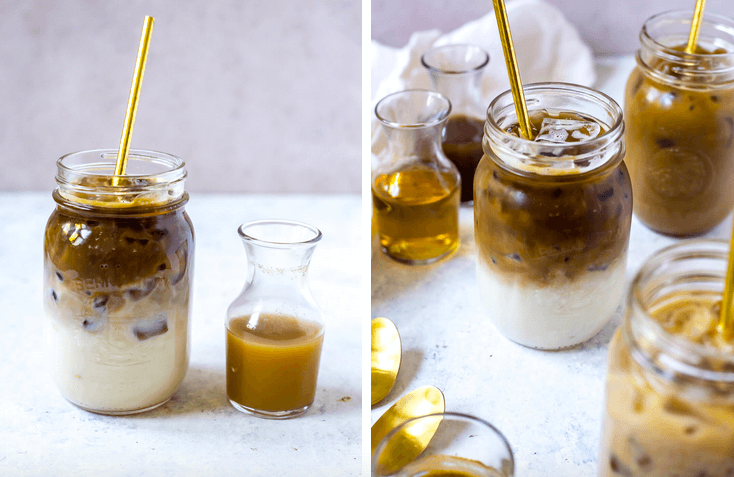 The trick to this Iced Caramel Machiatto recipe is making the rich dulce de leche caramel syrup and layering the espresso and milk; it’s way easier than you think too! Start with an empty cup full of ice, then add a couple tablespoons of the syrup. Brew your espresso using the Philips 3100, and pour it very delicately over the milk of your choice – I usually go with 2% but whole milk makes this drink extra creamy and over the top. If you don’t have dulce de leche at home (you can usually find it with the jams or in the ice cream isle of your local grocery store), simply boil a can of sweetened condensed milk for 3 hours in a large pot of gently boiling water. Vanilla lattes are so easy to make and you don’t need to splurge on an expensive vanilla bean to get good flavour with this syrup. Like the rest of the syrups here, the formula is pretty straightforward. Make a plain simple syrup by mixing boiling water and sugar together, then add in your flavouring of choice. For this vanilla latte, I used plain old artificial vanilla extract but you could use the more expensive pure extract or opt for the vanilla bean if you can find them. But really, the vanilla latte is the easiest of all to make. Like the machiatto, start with an empty cup full of ice. Brew two espresso shots and pour them over the ice, then stir in 1 cup of milk and add vanilla syrup to your taste. Yum! This chocolate iced mocha is made very similarly to the vanilla latte, and you probably already have the main ingredient at home: cocoa powder! Make the simple syrup from the Vanilla recipe above, mix in a tablespoon of cocoa, and you’re good to go. Start with an empty cup full of ice, pour your espresso shots overtop, mix in some milk and some chocolate syrup. Super easy! If you really want to take this iced mocha over the top, you could also use chocolate milk, or even add in a little mint extract to make it an iced peppermint mocha. Amazing combo right?! There are so many ways to get creative with iced coffee! Will you be trying any of these iced coffee recipes? Which flavour syrup is your favourite? 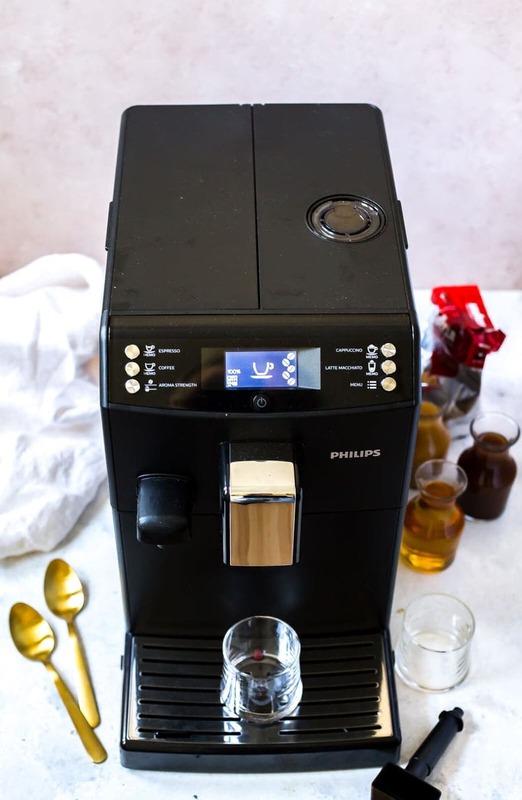 Be sure to check out the Philips 3100 on Amazon, Canadian Tire and the Hudson's Bay Company and then you can try these iced coffee recipes for yourself! 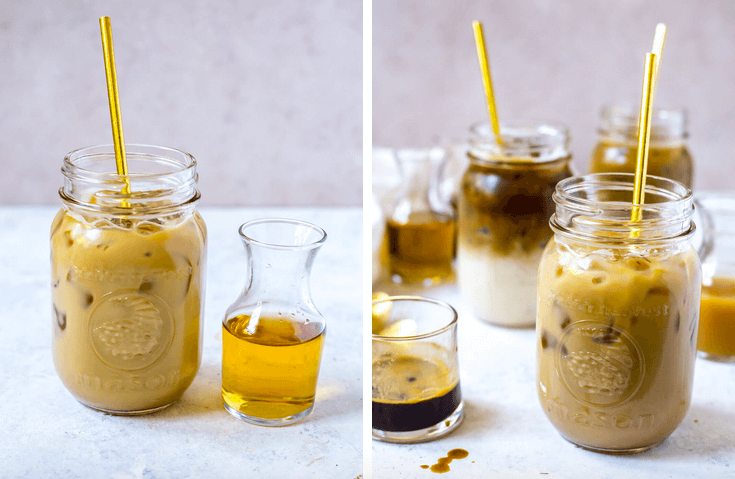 And if you're feeling really lazy and just want your coffee already, these iced coffee syrups are an AWESOME way to jazz up your summer drinks! 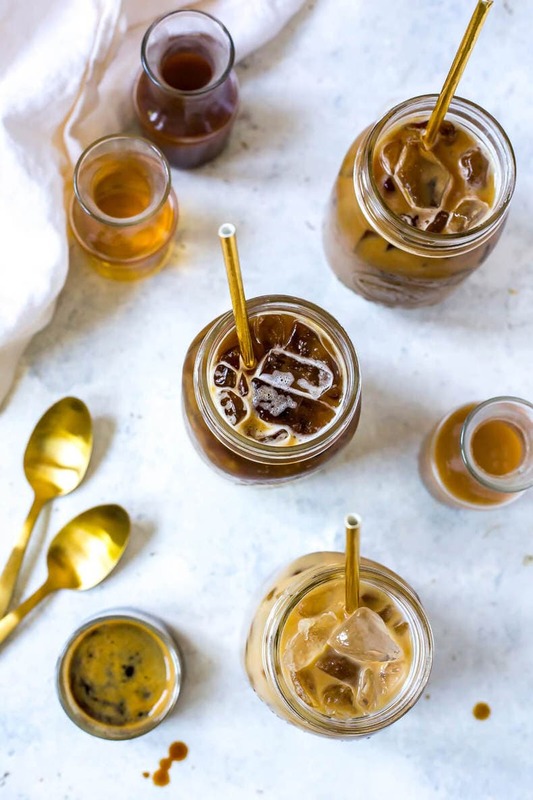 These 3 Iced Coffee Recipes are sure to please during the summer months! 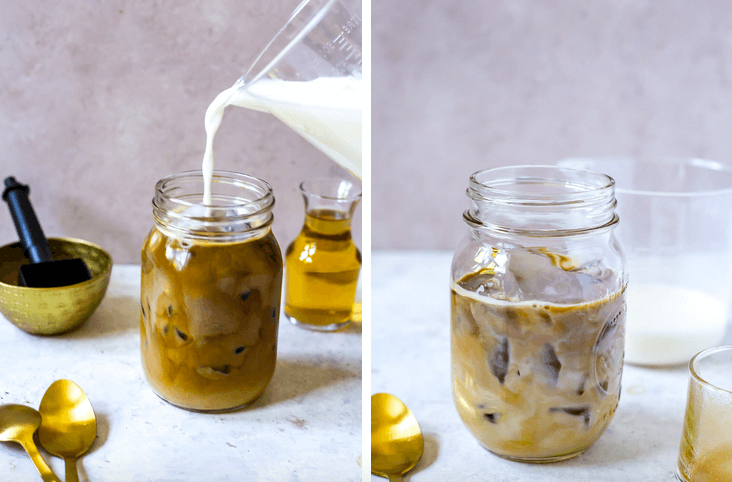 In this post I show you how to make an iced vanilla latte, iced mocha and iced caramel macchiato, and the three homemade syrups you'll make will last in the fridge for more summer coffee drinks! Prepare in advance: Bring water and sugar to a boil in a large pot on the stove. Divide into 3 heat-safe bowls or measuring cups, then add flavourings according to above. Chill for 30 minutes to an hour in the fridge (or freezer if you're in a rush!) Syrups can be kept in the fridge up to 4 weeks. 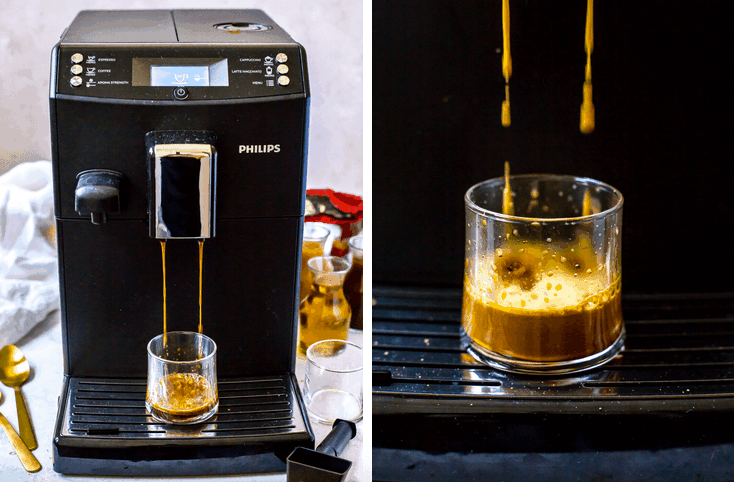 For the Iced Drinks: Brew espresso shots using the Philips 3100. Add ice to a large glass, then pour espresso shots and milk over top. Add in 1-2 tbsp syrup of your choice. Serve and enjoy! 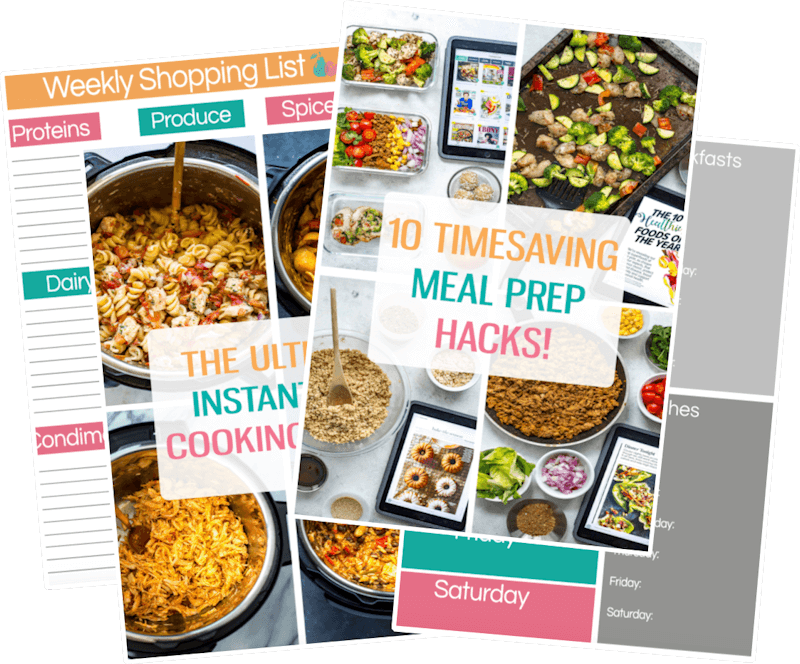 These recipes are mouthwatering, especially the Iced Caramel Macchiato hmm…..I love iced coffee year round too! Oops forgot to rate it, 5 out of five! Can’t wait to try it with the chilled espresso shots. Aww thanks Mia!! The Caramel Machiatto is one of our faves too and so easy to make! !